Indian roads are famous for their unpredictability. You never know what you may come across even if a road seems clear. We recently did a story on how a KTM rider encountered a metal grille on road while riding at high speed. Today we bring you another video, which raises the same issue albeit a bit differently. The video is apparently made using a dash cam fitted inside the car. In the video, we see mild traffic on what seems to be a highway. The car in subject is a Toyota Innova Crysta with ABS-enabled brakes. It is traveling at around 130-140 kmph and there is another Innova going at a similar speed, some distance ahead. Suddenly the Innova in the front applies its brakes heavily, and the Crysta, traveling at 140-150 Kmph, follows the action immediately. Now, a non-ABS car would get into an uncontrollable skid at such speeds, but thankfully due to ABS, the Crysta maintains traction. The car then comes to one side of the road and stops. 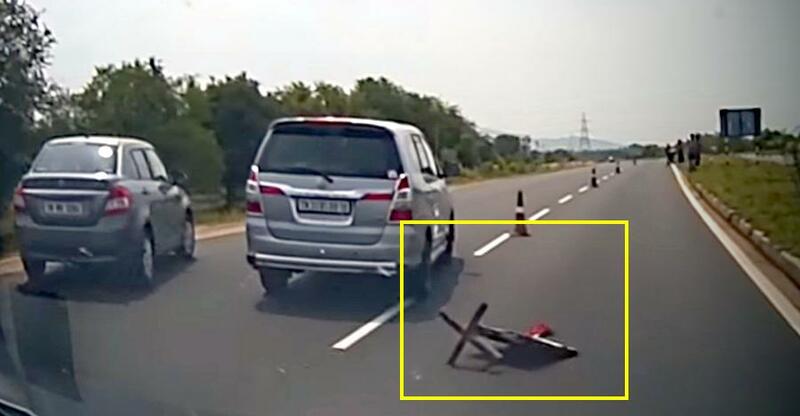 It seems the reason for such heavy braking action was some traffic cones lined up on the middle of the road with a Maruti Suzuki Swift Dzire in the same soup, as the Innova later found itself in. But as already mentioned, we can’t blame the roads or obstacles, as these conditions have to be anticipated in India. What saved these people is the Anti-lock Braking System (ABS)-equipped brakes, which didn’t lock under such heavy braking. Under ideal conditions, upon being applied, brakes are most efficient at stopping the vehicles just a fraction of a moment before the wheels lock. Simply put, braking power is highest just before the wheels get locked. The ABS system just does that, avoiding the wheels to get locked by releasing the brakes a little bit at a point when they are about to get locked and then reapplying them. This takes places several times in a second to maximize the braking efficiency. In non-ABS brakes, if the wheels get locked under hard braking, the vehicles slips off into a mostly uncontrollable skid resulting many times into heavy casualties. On roads such as ours, ABS is a necessary safety feature, which should be made mandatory by the government. Also, doing speeds, such as 130-140 Kmph is absolutely unsafe. Had the car been going at 80 or even 100 Kmph, there would have been no such drama involved, though we advise you to stick around 80 Kmph or the speed limit as applicable.